The UDRP (Uniform Domain Name Dispute Resolution Policy) complaint with case number 1483257 commenced on the 6th of February 2013. Usually the decision is published within one to two months after a case is commenced. The 2 domains were registered at Go Daddy on the 18th of January by an MIT alumni living in Wellington, Florida that is a registered Republican. The organization didn’t waste any time and filed the complaints in less than 3 weeks after the registration. IMPORTANT NOTICE: The website OrganizingForAction.com is NOT affiliated with any 501(c)(3), 501(c)(4), or other entity or business that uses the generic phrase Organizing For Action as all or a portion of its name. 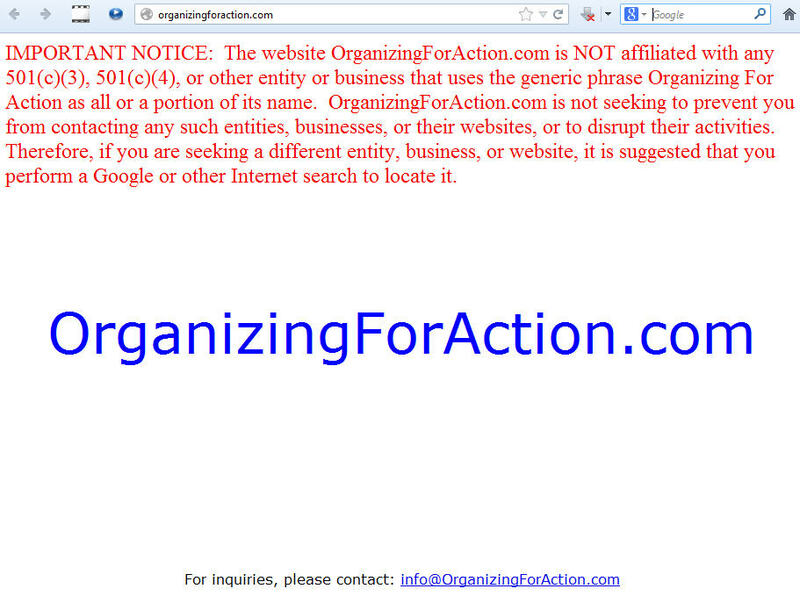 OrganizingForAction.com is not seeking to prevent you from contacting any such entities, businesses, or their websites, or to disrupt their activities. Therefore, if you are seeking a different entity, business, or website, it is suggested that you perform a Google or other Internet search to locate it. I emailed the owner of the domains and asked him if he plans to respond to the UDRP complaint. Last week I wrote about how Barack Obama’s Organizing for Action has failed to secure any of the corresponding domain names. The non profit organization failed to purchase any of it’s domain names before the news about the group were announced on January 18th. The result is that most of the domains were registered by other individuals and companies on the same date. I am not quite sure how the organization will prove the first element of the UDRP that requires the complainant to have a registered trademark or a common law trademark since the organization didn’t exist prior to the 18th of January. Interestingly enough an individual from Texas has filed a trademark application for the mark “OFA ORGANIZING FOR ACTION” at the United States Patent and Trademark Office. The mark that relates to clothing was filed on the 21st of January 2013. Organizing for Action (OFA) is a nonprofit social welfare organization and community organizing project affiliated with the Democratic Party. It is the successor of Barack Obama’s 2012 re-election campaign and of Organizing for America, which itself succeeded Obama’s 2008 campaign. Founded after President Obama’s re-election, the group seeks to mobilize supporters in favor of Obama’s legislative priorities. OFA is registered as a 501(c)(4) organization, which allows it to advocate for legislation but prohibits it from specifically supporting political candidates. In 1999, the Internet Corporation for Assigned Names and Numbers (ICANN) selected the National Arbitration Forum (FORUM) as an international dispute resolution provider for domain name disputes. Since then, the FORUM’s Domain Name Dispute Program has handled over 17,000 disputes worldwide.